Buying a basket of beauty products makes a lovely gift, but making one yourself is even lovelier! Plus this way you know exactly what ingredients are in the products – meaning you’re not only not harming your loved-ones with toxic chemicals, but your homemade products will be healing. The best part is that these products can be tailored to suit the intended receiver’s individual natural beauty. For example, hair rinses that enhance specific hair colours; moisturisers that suit either dry or oily skin; different essential oils in the deodorant to be more ‘flowery’, more ‘earthy’, more whatever… The options are endless and so is the creative enjoyment in putting this together! Some of the items included in this vanity case I have done previous posts on, so have included links to the posts for you to see the processes of making them, and for additional information relating to the ingredients. None of them are particularly difficult! Then you can either buy a vanity case to put the items in, or they are often to be found in charity shops, or if you can’t find one you can put all these things into a gift basket or box instead – perhaps packed decoratively using tissue paper, tinsel, foam peanuts, cellofane and ribbons. For how to make it, please see my previous post here. This is a very easy and simple moisturiser anyone can make at home, using ingredients you can easily obtain at your local chemist, health food store or online, and cost a fraction of what you’d spend on commercial beauty products… I love this moisturiser as not only does it leave your skin feeling soft and nourished, it’s also easily absorbed, and smells amazing due to the cocoa butter! 2 tblsp cocoa butter, 2 tblsp shea butter, 1 tblsp coconut oil, 1 tsp vitamin E oil, 1 tsp extra virgin olive oil, 2 tsp aloe vera. I then decorated the container using tiny glass beads and a glue-gun, and a hand-made label covered with sticky-back plastic. Our hair is able to condition itself with natural oils secreted from follicles, yet when we use shampoo these oils are stripped away and not only dries our hair out, but harms our scalps as well… This hair rinse will be suitable for all hair types, so you can try it out and then adjust the ingredients or quantities if you want to. It’s worth spending a bit of time researching, as there are so many possible ingredients to use, which will enhance your natural colour as well as taking care of your scalp. 2 tblsp dried chamomile flowers, 2 tblsp dried calendula petals, 1 tsp dried sage, 1 tsp dried rosemary, 1 tsp dried thyme, 2 tblsp apple cider vinegar, 2 tblsp witch hazel, 1 tblsp aloe vera. You can hang something decorative around the neck of the bottle for a nice finish. This is great for anyone with dry or damaged hair, as not only does it not contain any of the harmful chemicals that will further damage the hair, but the natural ingredients it does contain will help heal the hair and scalp. 5 tblsp plain natural conditioner, 2 tblsp dried chamomile flowers, 2 tblsp dried calendula petals, 1 tblsp dried sage, 1 tblsp dried rosemary, 1 tblsp wheatgrass powder. I make this in a similar way to the hair rinse above – First I put the dried herbs together in a jar and cover with boiling water. Allow to brew for at least 30 minutes, then strain into a bowl through cheesecloth or old stockings. Mix in the natural conditioner and wheatgrass powder, and then pour into a suitable bottle (using a funnel helps for this part!). I then put a hand-made label onto it, covered with sticky-back plastic, and a ‘necklace’ of tiny glass beads around the neck of the bottle. For how to make this, please see my previous post here. 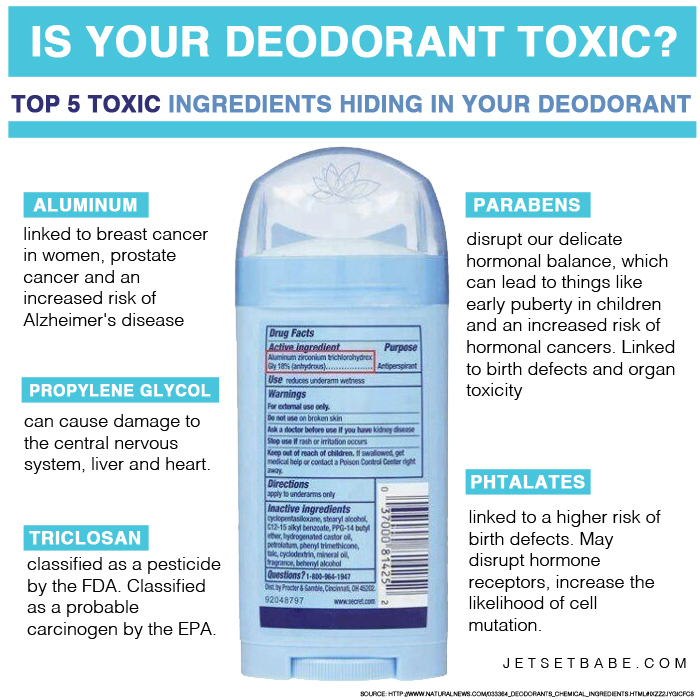 A very effective non-toxic and non-sting deodorant that takes care of your skin with all-natural ingredients… Commercial deodorants and antiperspirants usually contain a concoction of harmful carcinogenic ingredients, including aluminiun, parabens, triclosan, talc, propylene glycol, steareth-n and many others. These toxins are particularly harmful to women who shave their armpits, as skin is damaged and so procures a higher exposure. Also, as with any chemicals applied topically, they are absorbed into our bloodstreams and can cause any number of mild to very serious diseases. 2 tblsp shea butter, 1 tsp coconut oil, 5 drops vitamin E oil, 30 drops tea tree essential oil, 1 tsp aloe vera, 3 tblsp arrowroot powder, 4 tblsp Diatomaceous Earth (food grade). All I want to say – this is my favourite deodorant EVER. It really is extremely effective! These are like tea bags for the bath! Not only do they smell wonderful, but they are great for the skin, the body (as the medicinal properties of the herbs are absorbed), and mental health too as these herbs encourage relaxation. They are very easy to make, taking only a few minutes. 1 large piece of cheesecloth, 6 tblsp dried chamomile flowers, 6 tblsp dried lavendar, 4 tblsp dried marjoram, string or ribbon to tie. Fold the cheesecloth in half lengthways, then cut in half so you have 2 squares of double-layered cheesecloth. Put 3 tblsp of chamomile, 3 tblsp of lavendar and 2 tblsp of marjoram into the centre of each square, then gather up the edges and secure tightly using the string or ribbon. Easy! Then to use simply pop into the bath along with yourself, and you can soak there together 🙂 The cheesecloth can be re-used many times. I recently discovered just how easy candle-making is. A friend bought me a starter kit a few years ago and I only just got round to using it! It contains candle wax, wick, dye, and candle moulds. But if you’re unable to get a kit like this, just buy some wick, and you can melt down old candles – pour them into silicone muffin cases or jars, and they make lovely handmade gifts for people. I thought they would make a nice addition to the vanity case, as they can be burned whilst the person is enjoying a relaxing soak in the tub. I made this using an old ski-snood I never used, and I took the elastic part from anther worn-out head band. I cut a wide strip from the snood, folded it lengthways and sewed the seam. I then attached by sewing each end to the ends of the elastic part, and hey presto! You can also make even simpler versions of these by using stretchy material from old tops, leggings, stockings, even socks! Anything stretchy. This isn’t homemade obviously, but I did tie it up with a ribbon myself! It needn’t cost much, but a soft facecloth made from natural materials makes a nice addition to the vanity case. This is a long-handled brush from the Body Shop, perfect for dry-skin brushing (but it can also be used in the shower/bath). Dry brushing helps remove dead skin cells, unclogs pores and encourages the skin to release toxins. It softens skin, reduces cellulite and improves circulation. I bought a cheap simple mirror, then painted and gave it a coat of glitter for a nice hand-finished touch. If you have more time, you could buy a basic mirror and hand-make a frame for it yourself, using things like drift-wood, shells, dried & pressed leaves and flowers, wooden beads… anything you can think of! If you enjoyed this post, please follow me for more seasonal crafts and healthy recipes throughout December! Categories: Crafts, Healing the Body, Uncategorized | Tags: beauty, beauty recipes, homemade gifts, natural beauty, natural health | Permalink. Meet the love of my life – my son Sky. Just like all you other devoted parents, his health and happiness has been my number one priority from the moment I knew of his existence. I don’t want to waffle, but suffice to say mine was a complicated and traumatic pregnancy and birth. Due to having complete placenta previa, and then having my placenta hemorrhage, Sky was born by emergency cesarean 2 months early. He then suffered a collapsed lung the following morning, and had to be airlifted across the country from Donegal to Dublin, to a special intensive care unit. Argh. Tell you what, it’s a good thing I was dosed up on morphine and tramadol or I don’t know how I would have endured the heartache of being separated from him, and not knowing if we would ever be together. After a week in Dublin he was transferred back to a hospital in Donegal. For a whole month he was kept in intensive care, and I had to get the bus to see him every day, and come home without him every day. So, you can imagine after all that we both went through, his wellbeing was more important to me than ever. The skin of babies is even more delicate than ours, as it is much thinner and much less resilient than the skin of adults. It is more absorbant and more susceptible to irritants. Therefore, in my mind at least, it makes no sense to allow chemicals anywhere near them. We wouldn’t let them drink poison, so why let their skin absorb it? Hence why I use absolutely no chemical-filled baby products, only 100% natural, organic and edible products. Bathing too frequently damages the microbial balance by removing the beneficial bacteria on our skin, which we need for producing our own antibiotics. It also removes the natural oils, leading to dryness and skin conditions. Babies and infants don’t need much washing – I give Sky a quick wash before bed of his face, hands and groin area. It’s usually on a Saturday morning that he gets to enjoy a nice full bath. I add 1 teaspoon of ascorbic acid to the bath water, which neutralises chlorine and chloramine, which are very harmful contaminants. There are also other ways to reduce chemicals in bath water, which you can read about in a great article here. This is pretty much the same hair rinse as I use myself (see previous post here), but with less ingredients. I make a very simple mixture and put it in a spray bottle, then at bath time I spray it on his hair and leave it for roughly 5 minutes before rinsing. When he was tiny I only used water, but now he’s grown a bit I found his hair tends to stay slightly oily if I only use water, so this herbal rinse spray is the perfect thing. Soft, shiny, healthy hair, healthy scalp, and it smells great. I also found it helped reduce his cradle cap when he was smaller too. Put all the ingredients into a jar and cover with boiling water. Leave to brew for at least 30 minutes. Coconut oil is all you need for any dryness on your baby’s skin. I’ve tried a few other oils, such as almond oil and vitamin E oil, but I find coconut is the best. Apply a little every night to help keep skin moisturised during the night, or apply generously at every nappy change if your baby has nappy rash, and you’ll find their skin heals very nicely. Even sore and bleeding skin can heal overnight, it’s really that good! Perhaps it’s due to my no-chemical approach, but Sky rarely gets nappy rash, and when he does it usually coincides with teething, as the two often happen together. If you’re a user of cloth nappies, I recommend Disana organic raw silk liners to treat nappy rash, which have an anti-inflammatory effect. I have used them when needed along with the Disana knitted nappies, but they can be used with any cloth nappies. Although children don’t really need to start brushing their teeth until they’re around 2 (when teeth are touching and therefore food can get trapped), it’s not a bad idea to get them used to taking care of their oral hygiene. I love this banana toothbrush, you may have seen or even have one – made from food-grade silicone, toxin-free – for teething infants. It’s great for them to chew on, which is it’s main function, but the massaging bristles also gives them a sense of what it’ll be like to brush their teeth later on. When the time comes for Sky to brush his teeth properly, he won’t be using a fluoridated toothpaste, that’s for sure. Homemade toothpaste recipe coming soon from Natural Health Mama! I can’t stress enough the importance of diet for holistic health, though my WordPress followers will definitely know by now how enthusiastic I am about natural food! Simply put: if we eat crap, we’ll look and feel like crap, and the same goes for our children. If they eat well, and by that I mean fresh nourishing wholefoods, plenty of vegetables and fruit, good fats, no processed rubbish, no sugar… then their skin will be clear and glowing, their hair thick and shiny, their teeth cavity free, their eyes bright, their bodies strong inside and out. Diet really is the most important consideration for looking, feeling and functioning well. If you enjoyed this post, please follow me! Categories: baby, Healing the Body, Uncategorized | Tags: baby, baby care, baby health, baby skin, natural health, personal care | Permalink. A very effective non-toxic and non-sting deodorant that takes care of your skin with all-natural ingredients. I used to make a version with baking soda as that’s what most natural deodorant recipes recommend using, but I found that it stings quite a lot, even hours after applying it, and can also get pretty powdery when you sweat. Not so pleasant! So now I make this with non-GM arrowroot powder and Diatomaceous Earth instead, and this seems ideal as it doesn’t sting at all and doesn’t get powdery. (I happened to have some DE as my husband uses it both for gardening, and also dissolved in water as a detox drink). Some natural deodorants, as you may already know, aren’t very effective despite costing much more than commercial deodorants, and you can end up feeling quite cheated. The most effective one I ever bought was Jason Tea Tree Natural Deodorant, but now I have a homemade recipe that I find is just as effective, I won’t be spending 7 or 8 euros on buying that anymore. We seem to have this idea that sweating is bad, and that an effective deodorant is one that keeps you dry all day long. WRONG! Sweating is good, as it’s our body’s natural way of eliminating toxins, so we really don’t want to prevent the body being able to do what it needs to do to keep us in good health. What we do want is not to smell sweaty – agreed. But the good news is it’s completely possible to control odour without interfering with our body’s natural processes. Great! One important thing we all need to be aware of when it comes to body odour – what we eat has a massive impact on how we smell. If our diets are rich in processed, refined and junk foods, or drink a lot of alcohol, we will be a lot more smelly than if we eat natural, unrefined and unprocessed foods. It does make sense doesn’t it? The more toxins we put into our bodies, the more toxins our bodies have to eliminate. Personally after a few months of quitting processed food and switching to organic, natural, whole foods, I found I didn’t sweat or smell half as much as before. We also need to drink plenty of water to keep our body and skin hydrated, and for our sweat to smell less pungent. Another final thing to know before going through the recipe – when we initially make the switch from commercial to natural deodorant, our armpits will have a few days of cleansing themselves, so you might feel more sweaty or smellier than usual, especially if you’re used to being completely dry & sweat-free. Don’t be so quick to give up on natural deodorants though… your body will balance itself and adapt to the new armpit care you’re giving it! You can put it in a small jar and apply it with your fingers, but I recommend buying a cheap stick deodorant, then throw out the toxic deodorant inside it and clean the plastic container thoroughly, so that you can fill it with your homemade non-toxic version. You don’t have to store it in the fridge, but I suggest you store it somewhere cool. Apply as you would any other deodorant, and enjoy the peace of mind that comes with yet another non-toxic personal care product! If you enjoyed this post please follow me for more tips on making natural beauty products, as well as healthy recipes for homemade snacks and meals. Categories: Healing the Body, Recipes, Uncategorized | Tags: beauty recipe, healthy body, natural beauty, natural health | Permalink. Quitting shampoo and commercial hair products 2 years ago was the best decision I ever made for my hair. At the time I didn’t really know what I should use in place of hair products, I just knew that in order to have good health inside & out I simply had to stop putting all these harmful chemicals onto my body. To tell you the truth I get a lot more compliments on my hair now than I ever did before, and often get asked what products I use… When I reply “none” they are shocked! My hair is strong and healthy, and it’s that way because I don’t use products, not because I do. Just to note – my point in including photos of my hair isn’t because I’m vain and want you all to gush about it… It’s to show you that quitting shampoo and other products doesn’t mean you’ll have to endure a greasy mop! It’s a common misconception that when you stop using shampoo you suddenly have greasy and scraggly hair. Our hair is able to condition itself with natural oils secreted from follicles, yet when we use shampoo these oils are stripped away and not only dries our hair out, but harms our scalps as well. Many people opt for the ‘no poo’ method, and simply use water to wash their hair. Doing this will give you slightly oiler hair to begin with, but after about 5-6 weeks the oils balance themselves out, leaving you with hair that looks clean and conditioned. Other people, like me, use homemade hair rinses with natural ingredients specifically tailored to our particular hair types, and depending on what we are trying to achieve. I tend to get psoriasis from time to time, and so choose medicinal ingredients that soothe and nourish, and that won’t irritate my scalp. I am also now starting to get visible grey hairs (31 years old and it was a very traumatic pregnancy/birth of my baby boy!) so choose ingredients that naturally lighten hair as I don’t intend to dye it (at least not with toxic chemicals anyway). As you can see it’s shiny but not greasy, healthy-looking, and has natural highlights due to the hair rinse and sunlight. Oh, and the reason it’s wavy like that is I had been wearing it in a plait! This hair rinse will be suitable for all hair types, so you can try it out and then adjust the ingredients or quantities if you want to. It’s worth spending a bit of time researching, as there are so many possible ingredients to use, which will enhance your natural colour as well as taking care of your scalp. Add the apple cider vinegar, witch hazel and aloe vera, pop the top on and shake to mix. Spray on liberally when in the shower, massage in gently, and leave on for at least 5 minutes before rinsing off. I wash my hair this way once a week and find that suits me perfectly, leaving my hair feeling soft, detangled and healthy 🙂 I don’t use any additional hair products. I’m very happy knowing I’m not poisoning my body with toxic chemicals! Categories: Healing the Body, Recipes, Uncategorized | Tags: body, hair, homemade hair rinse, natural hair care, natural recipes | Permalink. Mother Nature is the expert beautician, providing us with nourishing and non-toxic ingredients that won’t harm our health. When we apply beauty products it’s crucial we give thought to the ingredients, as they can have a massive effect on our internal health as well as the external. When buying and applying beauty products, many people tend to forget that our skin is permeable and absorbs whatever we put on it. I’d guess most of us have at some point experienced adverse reactions to commercial beauty products, such as spots from clogged pores, skin rashes, dryness, itchiness, burning, etc, but those things are really the least of our worries. The chemicals contained in these popular brands we’re so fond of are extremely toxic, are absorbed right into our bloodstreams, and can result in serious health conditions that most people would never dream could be linked to a topical product. But the truth is not only can chemicals affect the surface of our skin, they can also affect our hormones, immune systems, nervous systems, reproductive systems, liver, brain, heart… everything!!! This includes all commercial make-up, moisturisers, lotions, soaps & handwash, shower gel, bubble bath, shampoo & conditioner, hair dyes, hair sprays/gels/mousse/wax/serums, perfumes & sprays, suncreams, spot/blemish creams, deodorants, mouthwash, make-up remover, anti-wrinkle creams, nail varnish, fake tan, face masks, face wipes, and so on… you get the idea. So, rather than continuing to use these harmful products, it might be time to seriously think about replacing them with natural products. This is exactly what I’ve done and I’ve never had better skin, better hair, better health. I used to be practically addicted to commercial products, never giving a thought to the ingredients as I was too focused on trying to enhance my appearance. I literally couldn’t do without them, and if ever I was away from home I had to bring a big vanity case with me packed full of all my favourite products! It took me at least 2 hours each morning to ‘get ready’, and was actually quite a burden in my life. But despite all my efforts and money spent, my skin was terrible – oily yet with very dry patches, prone to spots and blemishes, I looked ‘shiny’ all the time (with or without make-up). This is a very easy and simple moisturiser anyone can make at home, using ingredients you can easily obtain at your local chemist, health food store or online, and cost a fraction of what you’d spend on commercial beauty products. These ingredients usually last for ages and can be used to make many different beauty products, so definitely worth buying. I love this moisturiser as not only does it leave your skin feeling soft and nourished, it’s also easily absorbed, and smells amazing due to the cocoa butter! Measure out the shea butter, cocoa butter and coconut oil, and put into a small glass bowl. Fill a pan with boiling water and sit the glass bowl into it as a bain-marie (water bath or double-boiler). On low heat, stir the butters & oil until they are all melted (5 minutes), then remove the glass bowl from the pan. Stir in the vitamin E oil, olive oil, aloe vera and essential oils, if using. After about an hour, take the moisturiser out of the fridge and whip it up thoroughly using a teaspoon, or the handle of a teaspoon. This will make it nice and creamy. Pop it back into the fridge for another hour or until it’s cool and firm. You don’t have to store it in the fridge unless you live somewhere really hot, but keeping it in a cool place should suffice. You can apply it anywhere on your body – I use it mainly for my hands in dry or cold weather, and I use a tiny amount as a face moisturiser every morning. It also makes a wonderful homemade gift if you put it in an attractive container or tie a ribbon around the pot. Categories: Healing the Body, Recipes, Uncategorized | Tags: beauty recipe, Health, homemade moisturiser, natural beauty, natural health | Permalink. Once you discover the truth about toxic chemicals in certain foods, and what they do to our bodies, there is no going back. You won’t want to. I have been symptom-free for 4 years now, which I still can’t quite believe, because I really thought I would have to feel awful forever. Even on the happiest of days there was always this little dark cloud with its shadow, never allowing me respite from the pain and all the troublesome symptoms that my conditions entailed. Now, with no dark clouds in sight and continued good health, I enjoy more happy days than ever before. Several months ago some friends came to stay with us for a few days. One evening one of them kindly offered to cook us a meal, and of course I jumped at the chance of being cooked for! However, as it turned out she was not much of a cook, and prepared for us a ready-made lasagne from the supermarket. Well of course we ate it… but afterwards wished we hadn’t. Within 15 minutes – no exaggeration – I had abdominal cramps and was rushing to the loo. My husband, who had eaten the same meal plus a packet of cheese & onion crisps earlier in the day (which we never normally eat), was ill for the ENTIRE next day. Stomach ache wasn’t even the worst of it… He just wasn’t himself at all – couldn’t think straight, not really with it. Quite shocking really. Such are the toxic effects of additives in processed food, which are many times more noticeable when you’re someone who eats only natural, organic, additive-free food – i.e. food in its whole and unaltered state. When I refer to these harmful ingredients in processed food as ‘poison’, some of my family & friends just think I’m being dramatic. No. When I say poison I literally mean poison! I think I’ve reached a point where I’d actually feel quite offended at being served poison again for my dinner. If you aren’t already aware of the ‘scary seven’ food additives, please take a few minutes to read about them here. They are: high fructose corn syrup, trans fats, artificial flavours, monosodium glutamate (MSG), artificial colours, artificial sweetners, and preservatives. As those of you who read my previous post part 1 will know, I endured 13 years of chronic illness and misery before finally discovering the culprit – processed food. And I’m hoping that by sharing my knowledge and experience of this then perhaps others can be spared illness and misery also. The sad fact is that the food industry relies upon ignorance in order to continue selling their products, and I for one was indeed ignorant. To say “But nobody ever told me,” is a bit infantile, and I’m not trying to offend anybody here as I too was guilty of this for most of my life! No-one was forcing me to poison my own body with this imitation food, no-one was stopping me looking at the labels and finding out what these ingredients actually are. Ignorance is not really a good enough excuse. We all should be diligent in finding out the facts about what we ingest, rather than mindlessly shovelling the fuel in, and then wondering why we feel so crappy. But why aren’t we taking more responsibility for our own research, our own education, our own health? Do we really have to wait for some kind of ‘authority’ to tell us what’s healthy or harmful, rather than listening to our own bodies? When we put our minds to it, is it not actually common sense what constitutes real, natural, nutritious food? Is our problem simply that we don’t give enough thought to what we are eating? There’s an assumption amongst some of my friends that because I have cut out processed food, it somehow leaves me with very few choices. “But what do you eat? Just vegetables and rice or something?” A genuine query, but I can’t help but laugh. Truth be told I have never had so much variety, so much flavour, and so much enjoyment from what I’m eating! There’s an endless list of natural foods, an endless assortment of tasty dishes, and so many of them are just as quick and easy to prepare as ‘convenience’ food. Best of all, none of them make me feel ill; quite the opposite. I feel nourished. Above: an original recipe I posted – ‘Sweet Chilli Chicken Rainbow Salad with Rustic New Potato & Red Onion Salad, and Corn-on-the-Cob’. My advice for anyone who’s had enough of feeling ill, and seriously thinking about switching from processed to natural foods – you must first start by knowing exactly WHY you’re doing this. Otherwise you’ll likely allow yourself the ‘occasional something’, or not cut out everything (e.g. “I’ll only use stock cubes, they’re so small it’ll be alright”), or use the ‘too busy’ excuse and once again fill your cupboards with rubbish. A little bit of poison is still poison. Your resolve has to be firmly grounded with an attitude based on truth, and you’ve got to really grasp the fact that this stuff is not food, it’s pretending to be food. It might be tasty, it might fill your belly, but instead of nourishing it actually does the opposite – it slowly poisons your system, organs, brain, damages the lining of your gut, makes your immune system weak, increases susceptibility to illness, and increases the likelihood of developing chronic and even life-threatening diseases. Learning about what happens to our bodies on the inside is crucial to maintaining good health. It’s not enough to know ‘this is good and that is bad’, we have to understand why. For example, ingesting harmful toxins damages the lining of our intestines, and can cause what is known as ‘leaky gut’. This is where the intestinal lining becomes more porous, allowing the toxins to flow into our bloodstreams. This shouldn’t happen in a healthy body, and it is due to the mistreatment of our bodies by eating unnatural foods. Our digestive systems simply can’t handle these toxins, can’t eliminate many of them, and they build up eventually causing immune dysfunction… So we get ill, and stay ill.
Only by cutting out ALL harmful toxins are our bodies able to heal. Immune health has to be restored. Human bodies can only recognise and process natural food. The funny thing is, when you have something like leaky gut, you can start to find that even natural foods can cause adverse reactions, such as tomatoes, (which are acidic). In a healthy gut, natural acidic foods shouldn’t be a problem, but in a leaky gut all sorts of foods can make you feel unwell. It’s really important to understand what the symptoms of processed food poisoning are, and how to recognise when your body is having an adverse reaction. Many people accept their symptoms, perhaps because we experience them so often, and perhaps because most of our peers suffer with multitudes of health complaints too. Things like headaches, fatigue, sleeping disorders, allergies, abdominal pain/tenderness, excess gas, indigestion, acid reflux, bloating after meals, diarrohea/constipation, hot flashes, dizziness, aching muscles/joints, mood swings, difficulty concentrating, frequent viral infections, UTIs, kidney stones, high/low blood pressure, sore/itchy eyes, nausea, trouble regulating temperature, palpitations, dermatitis… Often we are dismissive of these symptoms, or try to explain them away, e.g. too much/little coffee, not enough sleep/exercise, ‘something I ate’, hormones, etc. Other times we convince ourselves we have contracted some serious life-threatening disease and are surely going to die. But the truth is many of our symptoms are down to dangerous additives in food, and are endured needlessly. The fact that our children seem to display a lot of these symptoms too as a result of a highly processed diet is very worrying. Upon learning that I eat no processed foods, many people have commented that they would “really miss” things they consider to be essential and enjoyable in their diets. Things like sausages, bacon, cheese, bread, pies, sauces, gravies, dressings, flavoured snacks (crisps, nuts), ready-made dinners, sweets & desserts, the list goes on… But I don’t find it difficult at all to avoid these things, Why? Because I don’t view them as food, so I don’t feel like I’m missing out. The only thing I feel is sorry for the people who are still consuming that rubbish, particularly the people who continue to suffer ill-health because of it. To me these kinds of things may as well have a skull and crossbones on the labels warning of their hazardous poisons. I can now spot them a mile off and rarely even have to check labels anymore. If something is advertised as being ‘packed with flavour’ it is just another way of saying ‘packed with poison’. There are those of us with diagnosed allergies who diligently avoid the things we’re supposed to avoid, and yet still eat processed foods. For example, one of my friends has coeliac disease and is so careful about avoiding gluten, but then laishly pours gravy over his sausages – gravy made from instant granules or stock cubes, and sausages also packed with MSG. It makes no sense to me, as not only should he be avoiding ingredients that make him ill, but surely he should be eating to heal. We all know the person who’s allergic to gluten, or eggs, or dairy, and everybody accepts the necessity of avoiding products containing these ingredients, yet we never hear of the ‘processed food allergy’. Why? Because we’re all allergic to processed food! I’ve no doubt many people would disagree with that statement, and assure me they have no symptoms, that they feel fine. But after years of nursing experience, plus continued research for personal interest & wellbeing, I have developed a very good understanding of food, health, effects of toxins, etc, and I know there’s no way we can continue putting poison into our bodies day after day, year after year, and avoid damage. Even if we feel fine, or exhibit no symptoms, I guarantee something somewhere inside is suffering because of it. And processed food is too profitable in our economies for any ‘official source’ to tell us not to eat it. Plus, as long as we all stay sick, the ‘healthcare’ industry benefits massively too. Then there are those of us who try to incorporate healthy and nutritious things into our diet because we’ve heard or read a certain thing is good for weight loss, lowering blood pressure, aiding sleep, reducing indigestion, or simply that “it’s good for me”. But then we have the impudence to complain “it’s not working”. And why is that? Because we’re trying to take these natural healing foods in addition to the damaging processed foods… but obviously our bodies can’t heal whilst they’re still being poisoned!!! It makes even less sense than drinking coffee when having a sleep-promoting herbal bath, or fighting a yeast infection with probiotics yet feeding the bacteria with sugar. This is where the quote I referred to in my last post really resonates – “Every time you eat or drink, you are either feeding disease or fighting it” (Heather Morgan). This should be in the minds of us all every single time we make a decision about what we’re about to consume, because it’s that important. Once we’ve established a good understanding and basic knowledge of food and how it effects the body, the next step in healing ourselves is actually making the changes. Getting rid of all the harmful foods and never eating them again. This is where a list of ingredients to avoid comes in particularly handy. You can simply print it out, using it to check against items already in your kitchen, and then keep it in your wallet for reference when grocery shopping. It may seem quite overwhelming or a bother to begin with, but I assure you that after a short while you’ll become familiar with what ingredients, brands, and types of food to avoid. I found the list to be a real saviour, as many foods are packaged in healthy-looking ways, but upon closer inspection reveal harmful ingredients. Even ingredients like ‘yeast extract’ or even ‘natural flavourings’ are to be avoided. There’s another helpful site here that allows you to type in the ingredients you’re not sure about, and it will tell you what it is, any alternative names, what products it’s found in, and possible health effects. The next step is establishing replacements for many of the things we consider essential at mealtimes, as it’s often the little things we miss the most – like stock, gravy, sauces, dressings, relishes – as most unfortunately do contain artificial additives. Even canned soup contains MSG, so can’t be used to replace stock either. This is something that threw me at first. I used stock cubes or stock pots in pretty much everything; gravy or sauces over most of my food. And I’m not a fan of ‘dry dinners’, so I couldn’t just do without. One of the biggest problems is we don’t or can’t spend much time in the kitchen preparing meals. When we consider how important nutrition is, it’s crazy we try to make the whole process as quick and easy as possible. Either we haven’t the first clue about cooking from scratch, aren’t interested enough to take the time, or don’t have the time because of work or family-related commitments. Of course these are valid reasons, but honestly if we’re really serious about ensuring our food is natural, nutritious, and won’t cause us physical or mental damage, we have little choice but to make more time for food preparation. Unless you’re wealthy enough to employ a cook that is, in which case please pay them well, as good food is good health, and good health is life! In time much shorter than you think, you’ll have established dishes and methods that you can prepare and vary without it being troublesome. Plus once you start to notice how much better you feel, you’ll not mind giving that little bit extra thought and time to meals. Like I said in my previous post, within 6 months of switching from a highly-processed diet to a completely natural one, I no longer had IBS symptoms, and within a year I realised my fibromayalgia had gone too. See – not only was I no longer poisoning my body, I was also providing it with medicine to heal… in food-form. What a relief! Now I have much more energy, I don’t ache, I don’t feel ‘foggy’ in my head, I don’t get bloating or stomach pains, no crazy mood swings, none of the many symptoms that seemed to rule and ruin my days. My skin is clearer than it ever has been, my hair healthy-looking… I don’t even sweat much anymore. I just LOVE feeling well, fit and healthy for the first time in a long time! And the best thing of all (thank goodness) I was equipped with the knowledge to eat well during pregnancy, and I know how to keep my child well and toxin-free now he’s eating solids. I don’t put anything into – or onto – our bodies unless it’s 100% natural, organic and safe. Crisps/chips, flavoured snacks e.g. nuts, cheese blocks, cheese slices, cheese spread, cheese snacks for kids, sliced ham, baked beans, spaghetti-in-sauce, tins of macaroni cheese etc, fish in sauce, salads with dressings, pasta salads, dips, dressings, sauces, custards, jams/jellies, stock cubes, stock pots, instant gravy, canned, packet & ‘fresh’ soup, marinades, hummous, coleslaw, sausages, bacon, minced meat, fresh/canned meatballs, meat-in-marinade, meat & veggie burgers, pate, battered/breaded fish or chicken etc, onion rings, quiche, sausage rolls, scotch eggs, pies & pasties, yoghurts & fromage frais, fresh & frozen desserts, puddings, cakes, muffins, biscuits, bread, bagels, pancakes, waffles, diet or low-fat products (e.g Weight-Watchers, Coke), diet sodas, juice/squash, packet noodles & pasta & rice & couscous etc, sandwich spreads, sandwich pickles, candies/sweets, chocolate bars & boxes, take-away and fast food items, microwave meals, ready-made sandwiches, vegetarian, vegan & soya products, packet mixes e.g falafels… jars, tins, packets, boxes of anything ready-flavoured. I will continue to post recipes regularly – for lunches, dinners and snacks – and you can be sure they will contain only safe ingredients. I’m also going to include easy and organic recipes good for babies and infants, the same as I feed my son, who is a very healthy and happy boy. A lot of the recipes I’ll share will be very straightforward – I know many of you struggle with ideas and/or time – as I hope to show you just how easy preparing natural meals can be. Any questions or information you’d like to be included, please comment here or email me at naturalhealthmama@yandex.com. If you enjoyed this post, please follow me and you can look forward to more natural health tips and healthy recipes! Categories: Diet & Nutrition, Healing the Body, Uncategorized | Tags: cures, food, healing, Health, healthy body, natural health, nutrition | Permalink.